South Perth Youth Network members with George Burnett Leisure Centre staff preparing for the ‘3 on 3’ basketball competition. South Perth Youth Network members Sherry Lee (left), Asmin Bourthier, Alice Annetts, Annabel Biscotto, Dylan DiAngelo and Jemma Schofield with George Burnett Leisure Centre staff Kieran O'Connor (centre) and Brodie McKee. THE South Perth Youth Network (SPYN), with the City of South Perth, has organised a variety of free activities to celebrate Youth Week. From April 13-22 the City will host hands-on workshops, inclusive sporting competitions and free entertainment starting with an outdoor screening of the classic film Jumanji at Neil McDougall Park from 6.30pm. 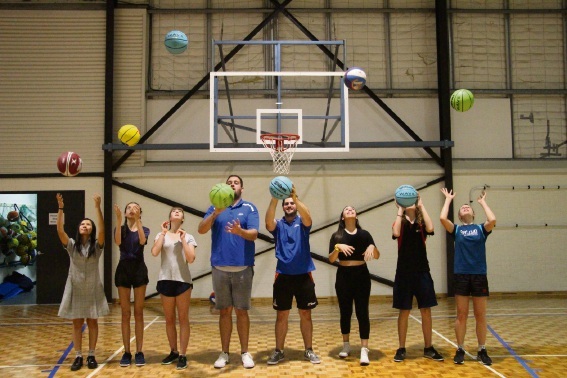 Players of all skill levels will be welcome to join in the fun at George Burnett Leisure Centre for the City’s ‘3 on 3’ basketball competition on April 16, with prizes for best team player, best shooter and most skilled up for grabs. Skateboarding WA will host its annual Manning Mayhem Skateboarding Competition on April 15 from 12pm, and a free skateboarding clinic open to beginners through to experienced skaters on April 18, from 9am, at Manning Skate Park. Mayor Sue Doherty said Youth Week was a chance for the City to recognise the invaluable, positive contribution young people make to the community. “The activities give participants the chance to have a lot of fun, explore new interests and discover new skills in a safe and supportive environment,” she said. The City received a $1500 State Government grant for the running of activities.